I’ve been living in India for over 3 years and it started and ended with a true love story. I was and am in love with Yoga. That was the reason I took a Yoga teacher training in Brazil for a year right after my first Yoga class. I just knew it, my whole body whispered right after only fifty minutes of a gentle practice: happiness is possible here. As the bullied ugly duckling in the famous tale, who had his heart pumping while spotting beautiful swans for the first time, without knowing that he himself would become one. My being ached for yoga because it was just a part of who I am. I quit my job (the “office” one, also funnily referred to as “the real one”) to deepen my yoga practice by travelling to India. I had no plans and very little money; however, I did own an inspiring backpack. I arrived and stumbled into chaos. India is pure chaos: a patient and smiley chaos of colors, smells and sounds. I had heard all about it, but my mind would insist on painting this picture of me having a quiet time by myself peacefully. I went straight to an ashram in Kerala where thousands of people (Indians and westerners) lived, visited or stayed for a while to attempt to fulfill this expectation and, obviously, I was completely let down. I took a whole month to be there and silence was just not a part of the routine at all. Nor there were peaceful people wandering around treating others in a loving manner. People generally seemed really hurt and were hoping to be a heal a little. Throughout the month, I did deepen my postural yoga practice, but I deepened even more my compassion and understanding. People did not need to treat me kindly or lovingly for me to wholeheartedly wish for their peace of mind. It was hardly what I was conditioned to feel: at first my mind tried very much to feel mistreated and outraged. I often questioned,”After all how can some come to a spiritual place to just be rude! Come on! I just asked where could I get the prayer book! ”But thankfully, Yoga kicked in miraculously. My heart could slowly spot people’s pain and it became what it already was: wider and more giving. Rudeness, lack of time or even plain straight judgment somehow did not feel personal anymore. After a month, I felt I was ready to move on. 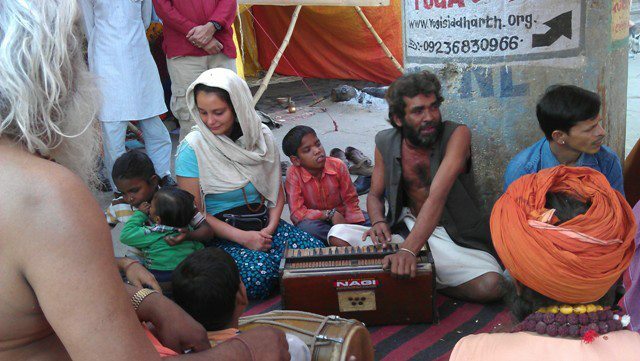 Right before I went straight to Varanasi, I met an inspiring Indian fellow who gave me two phone numbers of people who could help me out in Varanasi. Little did I know that the one I was able to reach, the Indo-German, was to be my last romantic love story and my husband eventually. But, first things first! Varanasi is a handful. The city is maybe the Hindu core of India and where you can experience having your whole being turned upside down: nothing goes as planed and everyone seems to fully accept it. I was unable to get a train ticket out of the city for a week; business man, children and spiritual sages were constantly trying to sell me candles, boat trips, a blessing (maybe you need two!). The traffic was, and is the craziest thing one can ever see: cows, buffaloes, dogs, people on foot, people carrying corpses to be burnt, honking cars, bicycles and motorbikes. At the same time different devotional songs playing from different temples or small shops all around, while you obviously step on some cow dung. If you don’t surrender, you have no chance. You are bound to turn into the crazy grumpy fellow screaming at rickshaw drivers for 10 rupees. I surrendered to this pulsing city and to the kind loving Indo-German Yoga geek, who shows me daily what true love really is. My ego would like to tell you that I chose all of that (wisely, of course!). But, it never felt like that. Again something placed a foot down and told me without a single word that this was the journey. I surrendered to India while India surely does not change even a little bit for anyone: she polishes us letting our egos bump around in every single plan or expectation. Sometimes it might feel like a nightmare but it surely holds the whole potential of changing into a true blessing. India and its treasures were and continues to be the best yoga teacher I have ever met. 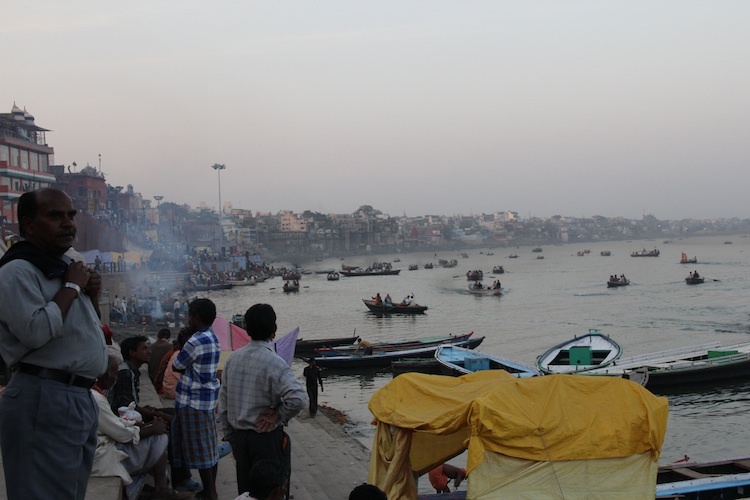 Varanasi is a wonderful and holy place.